Now despite the fact I find this a rather nonsensicle question, I would have to say from today’s experience – the answer is no. A resounding no. At times I was crawling along so slowly (ie uphill) I was sure pedestrians could easily pass me. 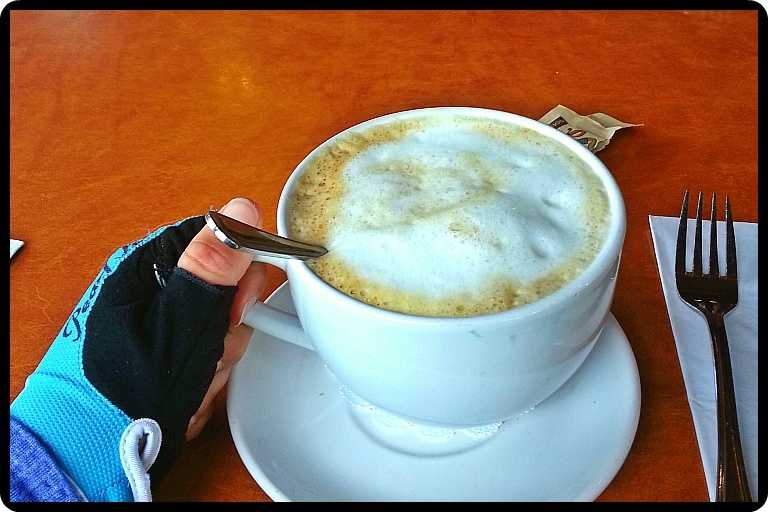 Today was my practice ride – for a lot of things…. my first long ride on my new surly long haul trucker, my first ride on a fully loaded bike, and my first ride in a long time using clip-in shoes. And sure maybe my snail’s pace could be due to the fact my legs are extremely fresh, but I certainly could not outride a bear – ever. Well unless it was one of those circus bears put on a fully loaded bike, and then maybe we would have a competition. Riding a loaded bike is hard! Without a doubt I will find this physically and mentally difficult, but I can do it! And now for my rambles…. 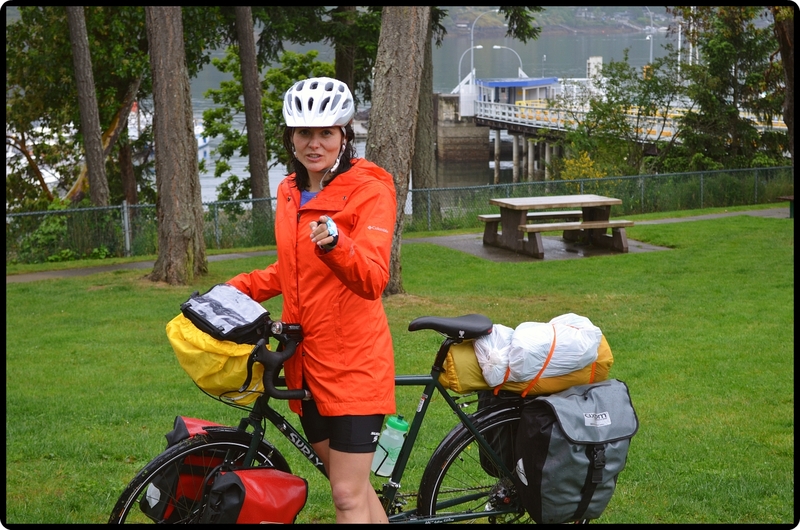 Of course it had to rain on the day I had decided to load up my bike and ride from Victoria to Nanaimo – but that was actually a blessing in disguise – an opportunity to test out my rain gear! The process of carrying all my bags and then my bike down from my 3rd floor apartment and then loading it onto the bike had me ready for my first snack break! And layer removal. Somehow all this needs to be attached to my bike…. 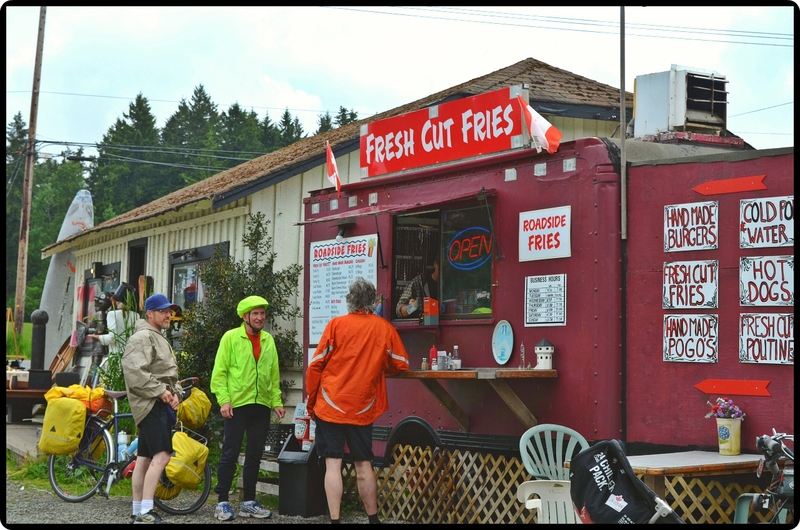 My intention was to ride the Malahat – the notorious hill between Victoria and Duncan – a way to really test my mettle. I had ridden about 12km en route to the dreaded pass – all the while my mind was filling with terrible thoughts of getting tired on the hill, trying to get out of my pedals, failing and falling into highway speed traffic. I was scared, but then fate intervened. I met Gerry, Richard & Warren. 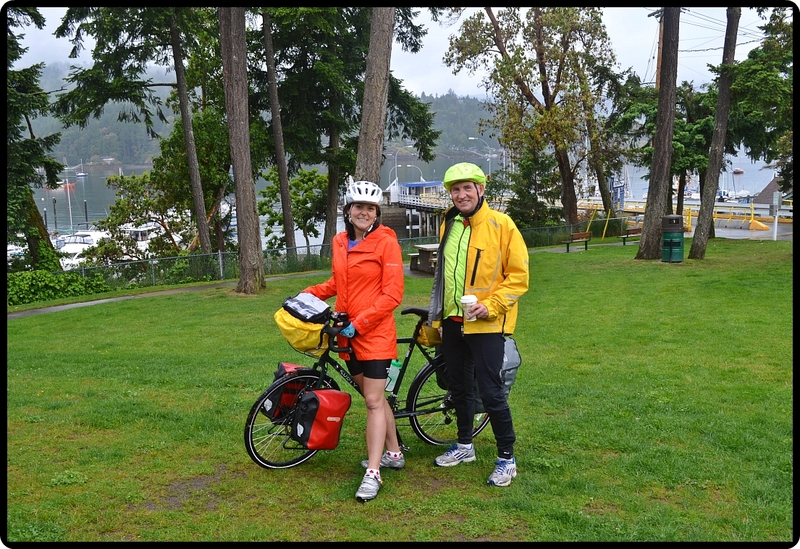 Gerry stopped to ask me directions to the Galloping Goose (bike trail into Victoria) and we started talking – turns out their crew had ridden down the Malahat last night – and strongly advised I do not ride it. In fact their advice had little to do with my newbie status, but more to do with the heavy traffic and construction that ate away at the shoulder. And when they mentioned they were going to the ferry that bypasses the Malahat and suggested I join them, I jumped at the opportunity. In line with Murphy’s Law, we arrived at the ferry just in time for their lunch break. So we all got a cup of coffee and talked bike talk. Turns out Gerry had cycled across Canada a couple of years ago (at the age of 70!) and he was a wealth of information for me. Richard and Warren have also dabbled in touring and knew a lot about bikes and the like. I felt like meeting these three men was a necessary part of my preparation for my cross country journey, as the ride itself today was. Lunch Break – Everything tastes better after riding! We rode the rest of the day together – and I gained more and more valuable insight along the way. Richard even showed me how to work my dial-in disc brakes when they started rubbing. He did most of the hard work – I just had to hold my bike up and brake when he told me too. After dialling the brakes in, and having the brake give zero response when I tried it – we both got concerned…….. until of course Richard kindly suggested I try using the lever for the front brake instead of the rear……. oh dear. I have a lot to learn! I left my new friends just outside of Duncan as they rode back to their car, and I carried on towards Crofton. The road seemed to turn considerable more hilly, and my legs were getting more leaden with the minute. I did not know how much longer I could go on – and I had to pee like mad. Finally I spotted a good wooded area with a ditch to lean my bike in to run in for a pee – I was hoping no one would come along and notice what was going on. Not only was this not the case, but a car pulled up…. and parked! What on earth?? How could I be so unlucky? But then I recognized the bikes on the rack and realized it was my friends! They were heading to Crofton and offered me a ride for the rest of the way – I had no idea how far I had left, but I felt done. 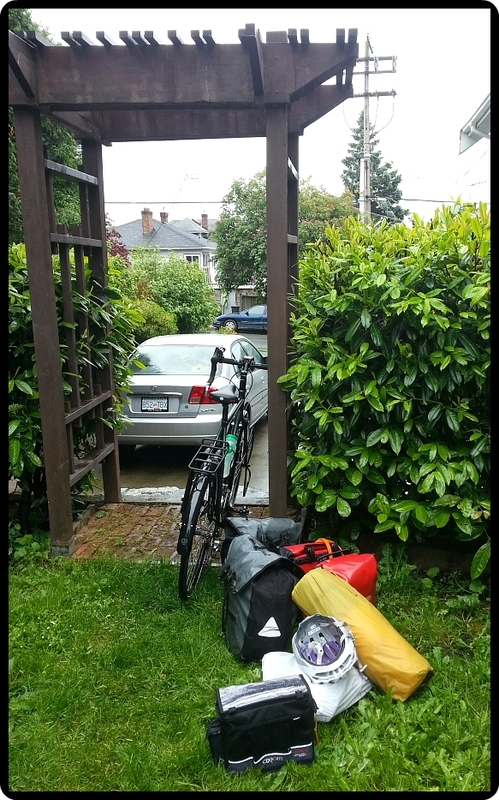 I eagerly loaded my bike into the van and enjoyed a very comfy seat for the next … 2.5 km. I ended the day in incredibly good spirits and celebrated with a cappuccino and cookie in the cafe as I waited for my ride. The near-constant rain and the unnecessary miles I did approaching/avoiding the Malahat were nothing compared to the warmth of strangers.